Good: Easy to end in top ten. Bad: Just get it on PC if you want to have fun. PlayerUnknown’s BattleGrounds, better known as PUBG, is the game that put the battle royale genre on the map. PUBG was the first game that successfully worked out the mechanics to ensure great gameplay, unlike other titles such as H1Z1: King of the Kill, which had the concept but did not iron out the wrinkles. With a long Early Access running on the PC, the game finally saw its release when it also became available for console. There are many differences between the two versions of the game, which is why we mention the console version in our review since we had our hands on the PS4 version. In the cruel world of PUBG, 100 contesters are dropped on a remote location that is filled with dangerous weaponry. The person that is the last man standing wins the glorious chicken dinner. Truth be told, nothing is known about the story but that isn’t what the game is about, it’s about killing others and surviving. While its main competitor Fortnite has put some very deep lore in the game that is getting discovered by theorists all over the world, PUBG remains empty like an old arcade game. We want to emphasize that this review takes a closer look at the console version and not its PC counterpart. There are some serious differences between the two and it would be unfair to bash on the PC version because of the lower quality of the console versions. The graphics are just horrible. 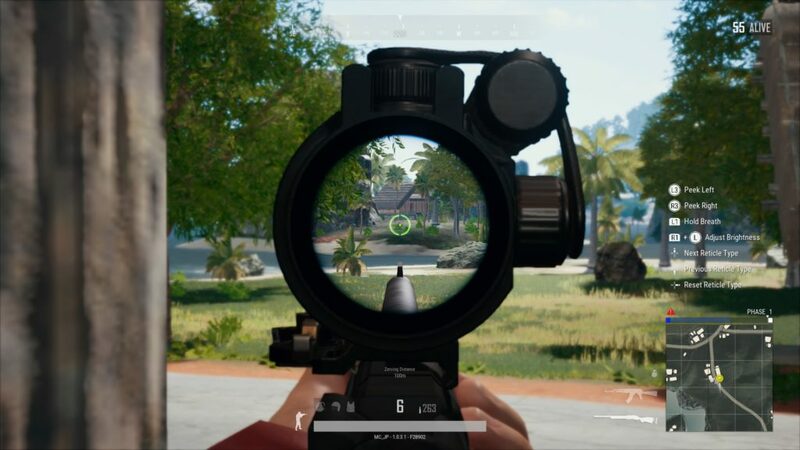 You can compare them with the lowest setting on PC as PUBG is a very resource-demanding videogame. Even the best gaming rigs have to work hard to play this game at a decent pace, meaning that console versions had to be greatly turned down in order to run at a stable frame rate. Some elements don’t even load in and remain in this pre-rendered state, while other graphics look quite fuzzy and just unappealing. If the game would be fun to play, you might be able to neglect its poor graphical state, but the gameplay isn’t that great either. You’ll also notice the sound has been badly ported, making it somewhat wishy-washy. When playing the game, there is a lack of decent audio feedback for stereo sound. However, if you use headphones, this gets much better. What is meant by the bad feedback? Each tactical gamer knows that you need to be aware of your surroundings (hearing footsteps, pinpointing gunshots), for which you must hear where the sounds are coming from. The sound isn’t bad, but just not optimized for TVs. 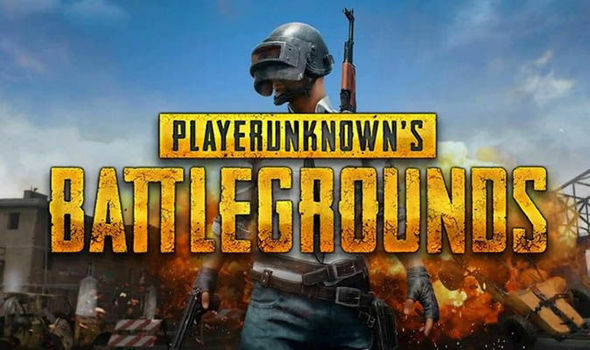 PlayerUnknown’s BattleGrounds is a battle royale game that puts 100 combatants on remote locations to fight until only one is left standing. The gameplay consists of various steps, first, you are flown over one of the few maps in the game and you can pinpoint where you want to go. When dropping, you must navigate through the air in order to make it to the landing zone of your choice. 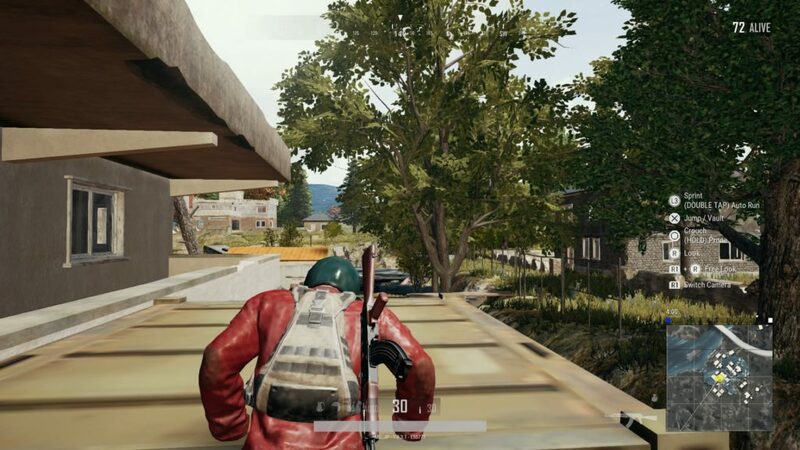 Naturally, some players want to drop the first on the ground to get to looting earlier, while others want to fly as far away as possible from the planes trajectory to have a peaceful moment, so they can look for gear without bullets flying all over the place. Each match starts with absolutely nothing, you have clothes (if you kept them on in the pre-game lobby) and that’s it. If you are unlucky and drop right next to another player either a fist fight can occur or both of you can start running around to look for a weapon. This is where the looting aspect of the game takes place as everything must be scavenged from locations around the map. Larger buildings mean more loot whereas you won’t find a lot of stuff on small remote parts of the map. There is a nice range of weaponry to collect and the weapons are easy to maintain as many share the same ammo type, and attachments are only limited to weapon types. Upgrading weapons can mean life or death on many occasions. For example, fitting your rifle with a good scope gives you a high range advantage on others, while having a front grip with a compensator and extended magazine makes you the Terminator in close encounters. Armor plays a very large role in the game since without this, gunfights can be concluded in a matter of seconds. However, if you have Kevlar protection and a good helmet, you might even outlast a more powerful opponent solely thanks to the protective gear. To get the cream of the crop of outfitting, you must find airdrops around the map. Sometimes you hear the plane fly over and it will drop a large crate, in which you will find exclusive high-powered weapons and top-tier armor. Since this is a game changer, many players will get lured by the offers of this divine intervention. Successfully gathering its contents means greater combat prowess but if the wrong person camps out these gifts from above, you are running into a well-placed trap. If you want to survive a loot run, you must keep an eye out on your status. Keeping your health topped up at all times is very important as well as there is no base health regeneration and most health items only heal you up to 75%. However, when taking boosting items such as energy drinks and pain killers, you will slowly regenerate lost health and even surpass the 75% limit to full health. Inventory management is another thing to consider when playing PUBG. You can carry two primary weapons and one secondary, a melee weapon and grenade on you at all times, but that’s it. As a result, players sometimes have to decide between having a larger ammo pool or stronger weapons with less ammo. Now that you are armed to the teeth, it is time to go exploring the map. Each match has a time limit so that nobody can camp for the rest of their lives. 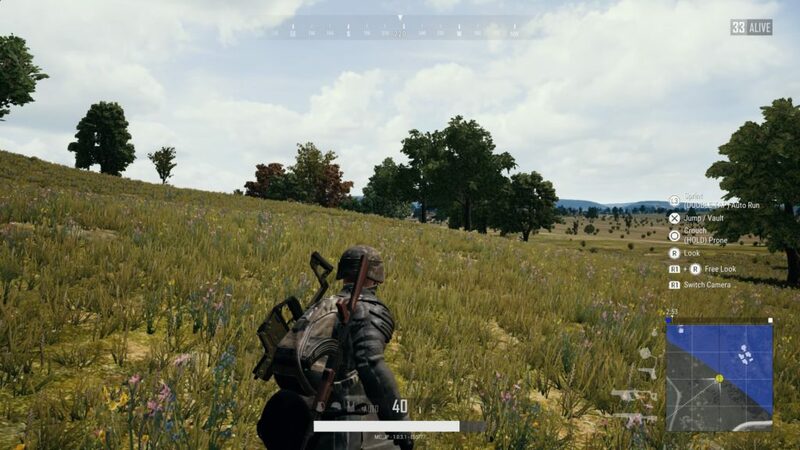 There is a circle that slowly shrinks as the match goes on and players must make their way to the safe zone in time because you don’t want to get stuck in the ‘storm’. On lower stages, the circle isn’t that damaging but near the endgame, this can become pretty much instant death. Not only do you have to fear other players that want your head and the circle slowly closing in on you, the game also has a third way to make or break you: danger zones. Just like in the movie ‘Battle Royale’, these red zones can be the end of you. In the movie you will die if you stay there, but the game is a bit kinder: it will only let artillery strikes rain down on the locations and if you are able to find cover or to dodge it, you are home free. 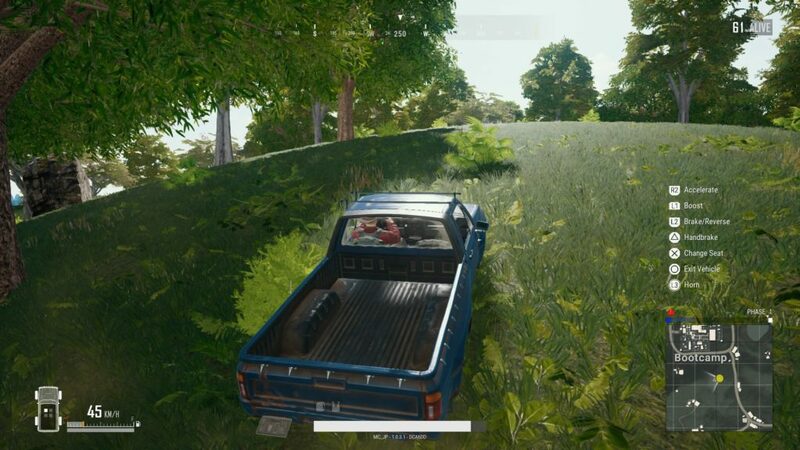 Travelling around the map is mostly done on foot, unless you are fortunate enough to find a vehicle, and there is a wide range of those in PUBG. Not only do you have a few types of motorcycles, there are more than a handful of unique cars ranging from simple civilian ones to fast muscle cars and pickup trucks. 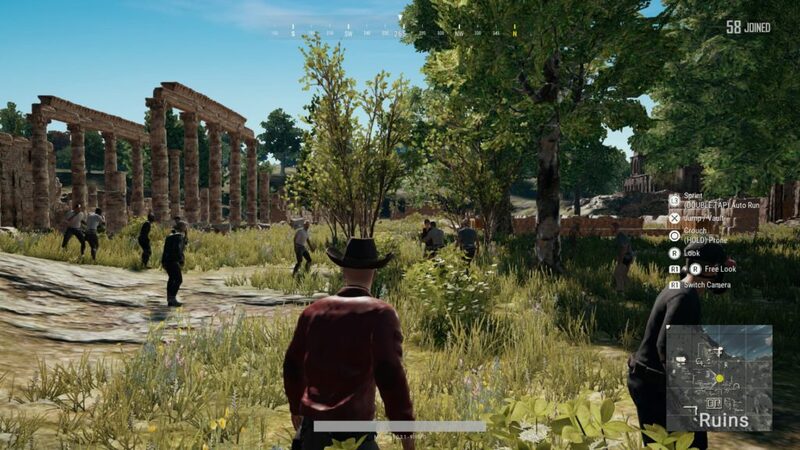 Now comes the bad part of the review; while the concept of PUBG is really fun and the PC version is very nice to play, the developers haven’t really optimized the game for consoles yet. Overall, console gameplay is horrible. Although the graphics have already been set on the lowest possible setting, there are still frame drops present. The inventory system is very bulky and slow to work with. Whereas in the PC version you can just simply click or drag items, here you really need to navigate like in a very old game, which means you are either playing the game slower or not fully utilizing everything it has to offer. In addition, the game hasn’t been configured nicely for the controller. While most games are perfectly flush with both operating methods (controller or mouse & keyboard), this game is just uncontrollable. Aiming weapons is rough as hell, closer combat is the equivalent of spray sessions that look more like gang shootouts than real liquidations. On the PC, all the combat goes nicely and pits skill against reflexes, but on the console, it is just impossible. Even though you can get a drop on your opponent, the slow, unresponsive controls ruin the complete flow. Not only is the sole purpose of the game ruined by this, the console versions are also much more limited content-wise. First-person mode is only available for squads, so you will be stuck to third-person view in each other mode (single, duos and, if preferred, squads). Being obligated to play the game in third-person view is not that bad, but there are also fewer maps and not as many options available. Adding the many bugs left in the game, this review isn’t becoming more positive, but there is a silver lining. Because of the overall state of the game, it is a breeze to land each match in the top ten, if you don’t glitch through the map or get stuck that is. While PlayerUnknown’s BattleGrounds is a well-loved title that runs well on the PC, its console port is just not cutting it. The concept of the game and the execution are done pretty well, and because the developers are finally putting more and more work into it, this game is a great one to buy, on PC that is. If you only have a console and really want to try this game, you can better wait until it’s cheaper or save up and invest in a gaming PC, as this game is really worth it.